Women who are dissatisfied with results from a previous breast surgery they may have received from another surgeon and those who would like to exchange their breast implants for a different type of implant can benefit from a breast revision surgery. This procedure can address a number of issues you may be having from your first surgical experience, whether it was a breast augmentation or breast reconstruction surgery. 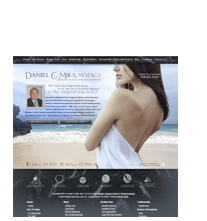 Dr. Daniel C. Mills is a skilled breast surgeon who can give you beautiful, natural-looking results more in line with your original goals. Please contact Dr. Mills to schedule a consultation for breast revision surgery or implant exchange at our Laguna Beach practice. Breast revision surgery can also help patients who are experiencing breast cancer or other health problems unrelated to the implant. Removal of the implants in these cases may be necessary for proper treatment. Dr. Mills will meet with you in an initial consultation to discuss your goals and all aspects of the breast revision surgery procedure. He will answer all of your questions, and come up with a treatment plan designed to meet your needs. Breast revision surgery can be performed in a number of different ways, depending on your goals. Saline breast implant removal will typically involve the inflation of the implant, followed by removal through the original incisions. Any scar tissue surrounding the implant will then also be removed. The removal of silicone implants may require the removal of some of the surrounding muscle tissue in addition to the implants. If you are exchanging your implants for a different model or type, the new implants are typically placed immediately after the original implants are removed. Dr. Mills is very experienced with this procedure and will make every effort to achieve your original goals with beautiful results. Breast revision surgery can be performed under general anesthesia on an outpatient basis. The length of surgery will depend on the extent of the procedure you undergo. Recovery from breast revision surgery varies with each patient. Implant removal and implant exchange typically involve some discomfort and bruising after the procedure; however, these side effects can be alleviated with medication. For patients who have had their breast implants replaced, they may need to wear a compression garment for a few weeks after surgery to help the healing process. Dr. Mills advises his breast revision surgery patients to not engage in strenuous activities or actions that can subject the breasts to harm for at least six weeks after the procedure. Many patients are able to return to normal daily routines within a few days following breast revision surgery. With breast revision surgery, Dr. Daniel C. Mills can help you attain beautiful, natural-looking results that meet your ultimate goals. Please contact our practice for more information on breast revision surgery.